So why should you have Amanda at your next event? As a Best Selling Author and Award Winning writer, Amanda knows what it takes to make dreams become a reality. 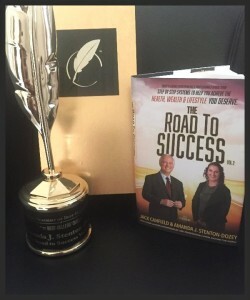 Amanda Stenton-Dozey recently became an Amazon Best-Selling author with The Road to Success Vol. 2 co-authored with Best-Selling author and speaker Jack Canfield. Amanda recently worked with several leading entrepreneurs and professionals along with Best-Selling Author® Jack Canfield, originator of the Chicken Soup for the Soul® series, to co-write the book The Road to Success. CelebrityPress™, a leading business book publisher, released the book on September 8, 2016. After such a successful release, The National Academy of Best-Selling Authors™, an organization that honors authors from many of the leading independent best seller lists, will recognize Amanda for her contribution. “I just wanted to say how much I loved last night! I got so much out of it! In fact I couldn’t stop fantasising about my dream life all night! During this Keynote address, Amanda J. will take your audience on an entertaining journey into the depths of the mind, to uncover the success that already exists in each and every one of us. Einstein once said “We cannot solve problems using the same mindset we used to create them”, and yet we continue to hit the same barriers, time and time again, seemingly, without any progress. Why is this? Well, to start with, we rarely actually THINK! We have confused ‘Mental Activity’ with ‘Thinking’ and this is why change seems so difficult.